The Super Secret Crisis War is over, but that doesn’t mean it’s the end of our favorite Cartoon Network heroes and villains. 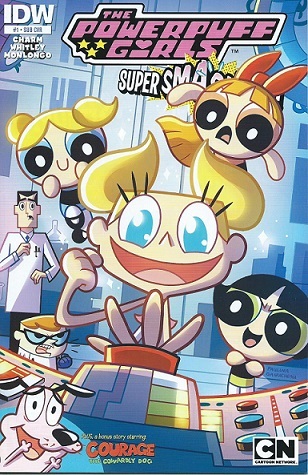 The Powerfuff Girls Super Smash-Up!, published by IDW, is a new crossover miniseries where Blossom, Buttercup, and Bubbles will team-up with various Cartoon Network characters. The story begins with Fuzzy Lumpkins kidnapping Ms. Bellum. 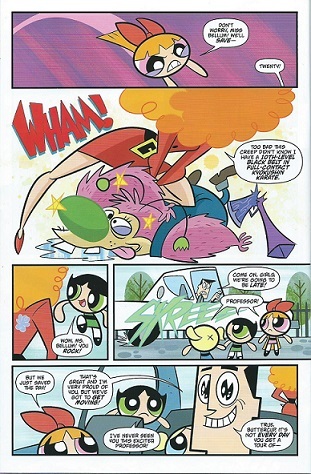 The girls arrived in time to see Ms. Bellum perform a move on Fuzzy, taking him down. You may wonder if we finally get to see Ms. Bellum’s face. Well I’m not telling, you will just have to read the story for yourself to find out. Next, the girls and Professor Utonium pay a visit to Dexter’s Laboratory for a VIP tour, with the professor giving Dexter a sample of Chemical X in exchange for the tour. Of course the obvious (and always funny) happened next. Dexter’s sister, Dee Dee, snuck into the lab. And yes, she is still a walking catastrophe. Actually Dee Dee is a dancing catastrophe. As always, she begins to dance and twirl, causing chaos in the lab. Chemical X spills over onto Dee Dee, turning her into a hideous creature. To make matters worse, she accidentally transports herself into another dimension. Derek Charm is the creative writer and artist. 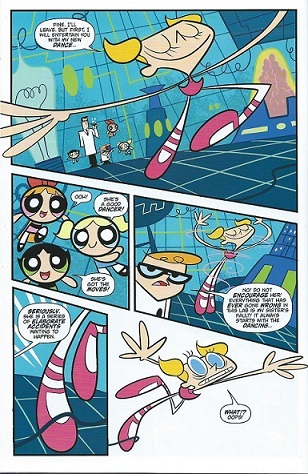 The story is just as entertaining as when I watched both cartoons on television, especially Dexter’s Laboratory. Dee Dee always stole the show, and it’s no different in this story. Excellent script, funny character interactions. The art is amazing with bursts of pretty, bright colors and fine details. Great action scenes. The Powerful Girls Super Smash-Up! #1 also contains a Courage the Cowardly Dog bonus story. It is a super short story, and since I don’t give spoilers, I’ll just say that it’s funny and weird like the cartoon on television. Jeremy Whitley is the writer. 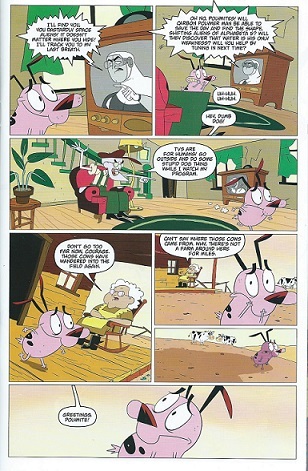 Fun and strange script, and in case you’re wondering, yes Courage is still a “stupid dog.” And he is still paranoid, and always first to notice strange events on the farm. Great artwork by Jorge Monlongo. I especially like Courage’s facial expressions. I laughed out loud as if I was watching tv. There is no doubt that I am going to continue to read this all-ages comic book miniseries. The Powerfuff Girls Super Smash-Up! #1 was released on January 28, 2015. I strongly recommend this title. I give this issue 5/5 stars.